This is a high level wrapper of Minoca build scripts and by no means should be treated as substitution of a such. Now it just works for me. Minoca-build tool abstracts some low level details of cooking things with make which could be safe way to go for unprepared user, but if you need to hack into process - please follow Minoca build scripts documentation. If you need ready examples, there are some at examples/ directory. Follow sparrow documentation if you want to install sparrow on none Minoca OS. 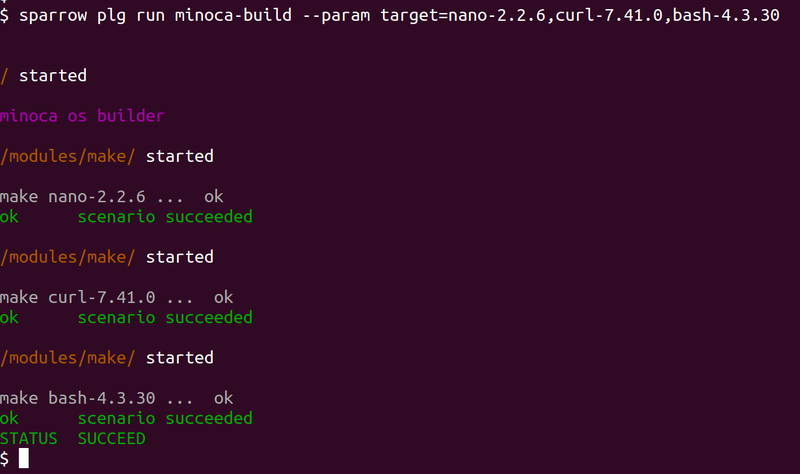 (*) TOOLS variable sets path to minoca toolchain binaries. You may define custom builds with either command line parameters. Tools are required to build all other packages, so this is probably the first thing you need to do. There is dedicate target for it called 'os' to build Minoca OS. Take a look at Sparrowdo - tool to run sparrow plugins over ssh ( and even more! ).